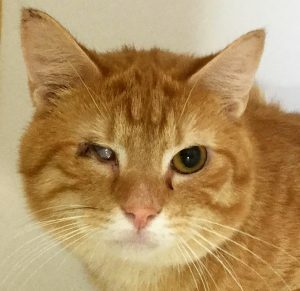 Dragon is ready to find a new home following a successful surgery to remove his right eye. It hasn’t been an ideal start for one-year-old Dragon, who had his right eye surgically removed, but he is hopeful with a second chance to find a loving home. Dragon, a domestic short hair, arrived in a bad condition and quickly underwent surgery and treatment to help him recover. 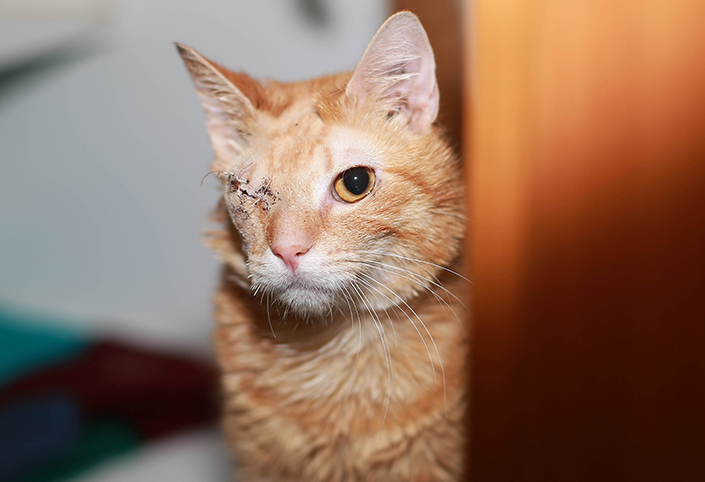 Although Dragon was brave, he suffered from a congenital issue of his right eye and was badly infected in both ears. Dragon before his eye surgery. Our shelter medicine team removed his eye before it led to a severe chronic infection, and treated his ears with antibiotics. Despite his tough start to life, Dragon’s love hasn’t even slightly diminished as he seeks his forever home. “Dragon’s so affectionate and doesn’t mind a cuddle,” said Amanda, cattery coordinator at The Lost Dogs’ Home. He is so affectionate that he will seek you out for an important ‘smooch’ session. “If you attempt to ignore him, he will not give up. While Dragon has plenty of love to share, he will need some extra love from his family. He has adapted to vision with one eye. His ears will need to be monitored, but further ear infections are easily managed if they do reoccur. “Dragon will need to be an indoor cat, as he can no longer fully assess the threats around him, such as dogs and cars,” said Amanda. Can you offer a special home to a special cat? View Dragon’s (ID 1038427) adoption profile or meet him at our North Melbourne shelter. Your gift today can help provide treatment for a sick or injured homeless pet, just like Dragon.